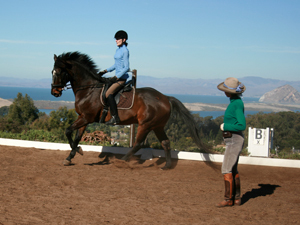 Come to Sea Horse Ranch for expert horseback riding lessons in SLO by Grand Prix Dressage rider, Barbi Breen-Gurley. 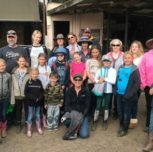 Barbi teaches motivated students of all ages and at any level of ability. 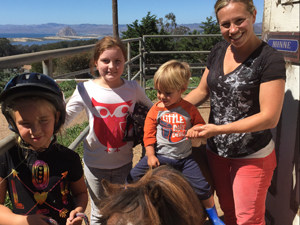 Enjoy professional horseback riding lessons in a congenial and picturesque atmosphere on the Central Coast. 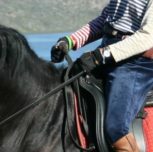 There is a pony for youngsters and school horses up to second level available. 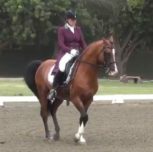 For more advanced students Barbi gives lessons on her Grand Prix schoolmaster. Barbi’s horseback riding lessons always stress the importance of a correct position and an independent seat. She starts many riders on the Longe Line in a covered Longe Arena. This is where an inexperienced or nervous rider can safely focus on the specifics of position, balance and clarity.